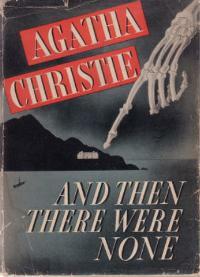 First published serially in 1939 under a very offensive title that most of you have probably seen at some point and then released in book form in 1940 as And Then There Were None, this is one of Agatha Christie's most shocking and well-known stories (and this cover is fantastic!). The title refers to the last line of a poem in the vein of Ten Little Monkeys Jumping on the Bed except instead of a little head-knocking, each "Indian" in the poem ends up dead. So when ten seemingly unrelated people end up stranded on a mysterious island under false pretenses, their lifelines all start looking rather short. Though the outcome of the story is pretty obvious from the title, the way it unfolds is anything but obvious. With an unknown murderer loose and no way to escape, the psychological tension comes through on almost every page as we see into eight increasingly disturbed minds. Though this was a rare re-read where I did remember most of the ending, I couldn't remember the exact course the story took and I was hooked again from start to finish. This is the last day of the month and should be the end of Christie November but I am still working through Agatha's autobiography. It's a great read but is so jam-packed with stories and tidbits that it's taking a while to get through. I hope to finish it in the next couple days. Therefore, Christie November will bleed a bit into December. I remember thinking when I first read it "How is she going to explain *this*?!". Christie is a master of this type of setting, where the full cast is contained (boat, island, train). It is one of my all time favourite Christies and I have certainly read it more than twice, which says it all really! I have never seen the film though which I imagine is good. I read this when I was 10 or so!! And I love how this is "bleeding" into December. Great word choice! Alex - I thought that the "voices" of the cast didn't vary much in this one but it didn't matter. And I felt the same way the first time -- "wait, everyone is dead ..."
Hannah - I think I saw the film once but I plan on going back and seeing it again. It's a great story! I don't remember reading this but saw the film. Looks like one I need to "find". I read this in high school, but have been on such an AC kick in the last couple of months that I want to re-read. I only wish I had been paying attention so I could have participated in the November event. Drat. Al - I don't remember most of what I read but I remembered who ended up being the villain in this one. I couldn't remember how it unfolded though so it was still a good read! Cozy - I don't remember how similar the film and book are but I bet it would still be worth reading! Rose City - Bummer! But you should definitely do a re-read. I'm loving each one I do. Great reminder to me to read this one again. I love Agatha!